LuckIn soap dispenser with elegant and modern look are dish cleaning and hand washing, refillable and reusable. Dishwasher soap dispensers are durable, only built with the finest components. The pump of soap dispenser is specifically designed to stay primed so it always delivers soap on the very first pump, and doesn't drip. LuckIn liquid soap dispenser has 3.15" nozzle and 10 oz soap bottle. What's more, refilling the soap or lotion from the top, never scrawl under the sink. 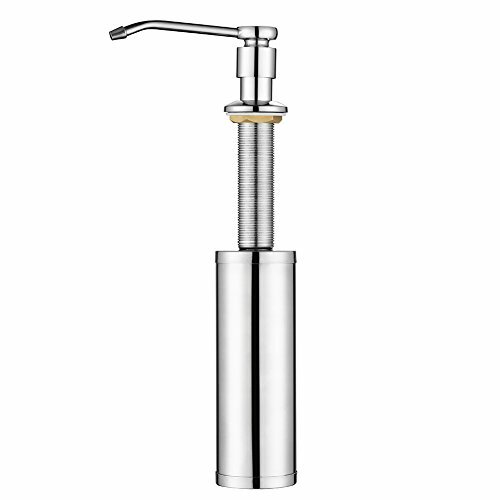 Made of brushed 304 stainless steel, these soap dispenser is durable and recycle. Easy push, perfect for liquid soap, lotion or liquid detergent. Constructed with high-grade 304 stainless steel, these hand dispensers are durable, rust-proof and against daily scratches. Built-in soap dispenser is adjustable for fitting kitchen sink counter through tightening copper nut, refilling from the top. Designed with an easy-dispensing mechanism, hand soap dispenser is easy to press soap out and easy to install. Dish soap dispenser can be repeatedly used to add soap, shampoo and shower gel for cleaning, reducing germs and preventing disease. Stainless soap dispenser with 10 oz bottle can be pumped easily into the sink. Maximum thickness of sink countertop is 3.15 inch. Please check your sink thickness before purchasing this elegant soap dispenser. If you have any questions about this product by LuckIn, contact us by completing and submitting the form below. If you are looking for a specif part number, please include it with your message.